Happy Monday everyone ! I hope you all had a great weekend. My previous post 51 Title Ideas for naming your 'Morning' Paintings was one of the most popular posts on this blog, So, today, I decided to share a list of titles to inspire you to name your Meadow Paintings. Happy Monday everyone ! I hope you all had a great weekend. Today I am so excited to share with you on how i painted this flower meadow. It’s my favourite subject because it’s so easy and really fun to paint. 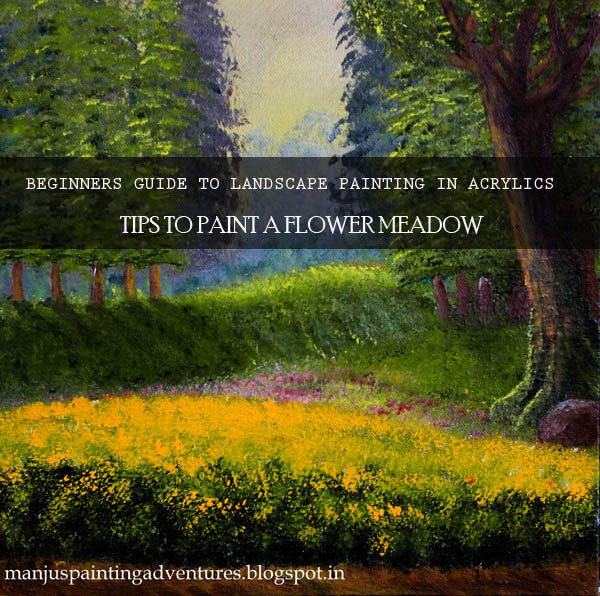 If you are struggling to paint a meadow, then this tutorial is just for you. Do you ever find yourself stuck in finding the perfect title for your paintings? Here is a list of titles I like the most for a Morning painting. Hello there!I'm Manju from Kerala,India. I am a self taught artist who believes in Anyone Can Paint.This is my little corner of the world to share the things i am most passionate about, a place to share my thoughts on art.Thank you for stopping by and viewing my paintings. I am glad you're here. Stop by often and stay awhile! Follow Manju's board Manju Raj Paintings on Pinterest.